A two-bedroom on the 40th floor with one of the building’s rare terraces is yours for $7,385 per month. ‘New York by Gehry’, so good they named it twice… Also known as 8 Spruce Street, the 76-story tower is unmistakably Gehry. Adorned with his trademark exterior, a crumpled stainless-steel skin, it resembles a half-crushed can of Japanese beer if we’re being trite. He’s the go to man when you want a building to scream contemporary cool, and this one ticks all the boxes. Twisting skyward through its 76 stories to a height of 870 feet, it’s the tallest residential building in New York City. For those who can afford it, it offers the most prestigious, modernist and chicest 360 degree views of the Big Apple. gauge steel, hand-finished in Japan. 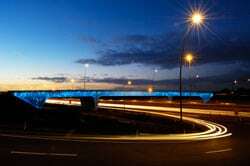 Its engineering took three years and fabrication two years. The façade is constructed from 10,500 separate 1,000-pound sculptural panels, 9,000 of them unique. The building comprises 903 market-rate rental apartments – but be warned – architectural landmarks don’t come cheap. A three-bedroom abode on the 58th floor is available for $17,169 a month. A two-bedroom on the 40th floor with one of the building’s rare terraces is yours for $7,385 per month. According to the New York Times, the smallest unit at 8 Spruce Street is a 450-square-foot-studio up for grabs at $3,000 a month. “In recent years, there’s been a good deal of hoopla surrounding new condominium buildings—structures that are relatively small and high-end, and aimed at a rarefied segment of the market,” says Paul Goldberger. “But what happens when you’re trying to attract not a couple dozen rich people, but several hundred?” Clearly, we’re still stuck for an answer. We must go then to the root of the building to find the answer. Gehry understood that he was effectively building an elevated neighbourhood of nearly 1,000 homes. The building’s outward appearance may be the most radical addition to the city’s iconic skyline in decades, but in opting to design the base out of brick, Gehry has succeeded in tying the building in with its surrounding neighbours. Further evidence of his socially reflexive practice is the elementary school located in the base of 8 Spruce Street, which has the capacity for over 600 young students. While we may not quite be in the realms of Mr and Mrs Average and their 2.4 children, Gehry has employed the concept that even the young movers and shakers of Wall Street need to take tentative steps towards starting a family before reaching the dizzy heights of corporate success. Or at least to get the ball rolling before they organise a mortgage. The 100,000-square-foot public school takes up the first floor and right through to the fifth. In fact, it’s the first ever built in New York City on private land. In addition, there are also doctor’s surgeries, which are linked with New York’s Downtown Hospital. There’s also 1,300 square feet of ground-floor retail space and 26,000 square feet of below-grade parking – and for 175 cars for hospital use. The development also includes 15,000 square feet of open space in two beautifully landscaped public plazas. The building’s first apartments, located on floors seven up the 38th Floor, were introduced to the market in February 2011. They had a hugely enthusiastic response. In just five months, 40% of the building has already been rented. The upper floors from 40 through 76, featuring large two and three bedroom units, were released to an eager market in July 2011. 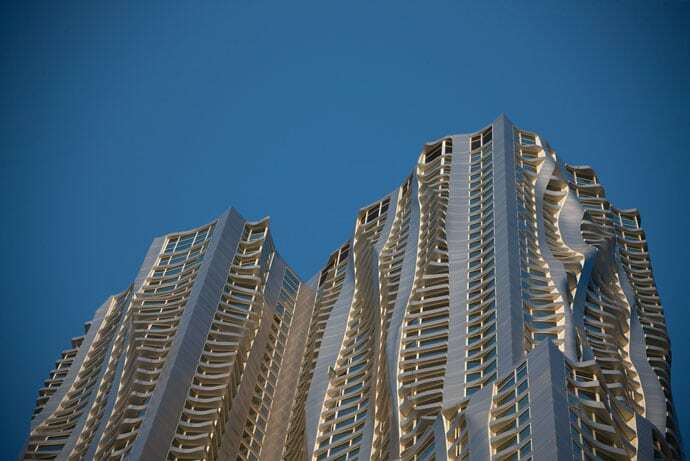 New York by Gehry is Frank Gehry’s first high-rise residential mixed-use commission in New York City. Among the many notable buildings designed by Frank Gehry are; The IAC/InterActive Headquarters, Manhattan, completed in 2007; the Walt Disney Concert Hall in Los Angeles, completed in 2003; and the Guggenheim Museum Bilbao in Bilbao, Spain, completed in 1997. Field Operations, in collaboration with Dutch horticulturalist Piet Oudolf, has designed the project’s two public plazas. Known for strong, contemporary designs for significant urban projects, Fields Operations, the creative force behind the High Line, is designing Columbia University’s Manhattanville expansion as well as a master plan for the 2,200-acre former Fresh Kills landfill on Staten Island. Forest City Ratner Companies, which owns and operates 31 properties in the New York metropolitan area – including Downtown Brooklyn’s transformative MetroTech Center and the acclaimed Renzo Piano-designed New York Times Building in Manhattan. This $11.5 billion NYSE-listed national real estate company is principally engaged in the ownership, development, management and acquisition of commercial and residential real estate and land throughout the United States.